KBee announces the world’s first cost-efficient Industry 4.0 robot that everybody can program and safely use. Munich, Germany – April 23, 2016. KBee introduces FRANKA EMIKA—a revolutionary human-centered robotic system—to the market. FRANKA EMIKA is designed for human-robot collaboration, is extremely cost-efficient and lives in the cloud. FRANKA EMIKA is also the first robot that builds itself; therefore perfectly suited for mass production. FRANKA EMIKA was built, designed and developed by KBee AG. It is a collaborative, lightweight robot system that is designed specifically to serve and seamlessly interact with humans. FRANKA EMIKA can be operated and programmed by anyone, regardless of technical skill, in just a few minutes through a visually intuitive setup process. 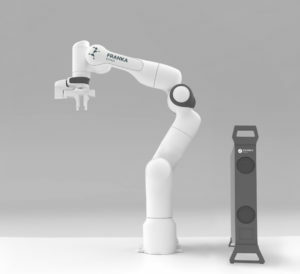 FRANKA EMIKA consists of the robot system FRANKA ARM and FRANKA CONTROL, the gripper FRANKA HAND, the software FRANKA DESK, and is connected to the FRANKA CLOUD. FRANKA ARM is a human-safe, force-limited robot arm with torque sensors in all 7 axes that enable humanlike arm agility and sensitivity. FRANKA EMIKA also has a unique workspace that ranges from close to its base to a maximum reach equivalent to the length of a human arm. With a payload of 3 kg and a repeatability of 0.1mm, FRANKA ARM enables a wide range of possible applications for customers. FRANKA DESK, which is the visual and APP-based programming software, runs on the browsers of everyday devices like tablets and computers. Thanks to its intuitive, user-centered set-up and programming system, no special skills are necessary to operate the robot, even for its most complex applications. Therefore, everybody can easily operate FRANKA EMIKA. With the revolutionary FRANKA CLOUD, it is possible to deploy 1 or 1,000 FRANKA EMIKA robots in no time, and to share and archive TASKS and APPs locally or globally. FRANKA CLOUD enables a seamless connection to Industry 4.0. FRANKA EMIKA will be unveiled to the public on April 25, 2016 at Hannover Messe Hall 17 / G17. KBee AG is based in Munich and was founded in 2013 by the DLR spinoff, Kastanienbaum GmbH. Its main investor, KUKA AG, is one of the world’s leading robot manufacturers. KBee develops and designs human-centered industrial robots that can be used by anyone and are unmatched in cost-efficiency. KBee’s vision is to make robots a commodity by putting humans at the center of robot design, to introduce the most intuitive customer experience, and to connect automation with digitalization. Dieser Eintrag wurde veröffentlicht in English, General, German, Hardware von Sebastian Trella. Permanenter Link des Eintrags.